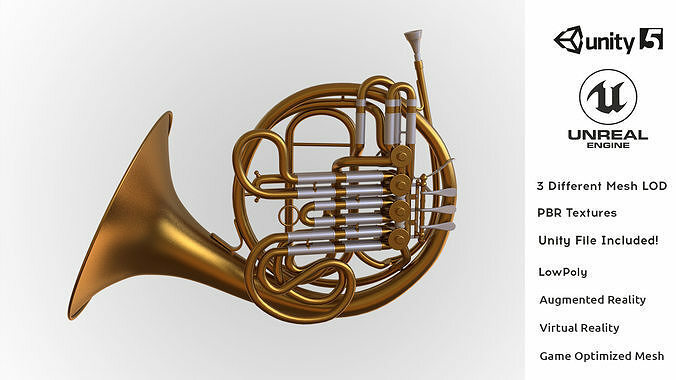 Photorealistic High-Quality Game Majestic Classic French Horn AAA, AA and Low-poly Mesh included! Clean UV unwrap and proper Topology model. 100% optimized UV unwrap. Professionally created model. High quality Texture for physical based shaders and compatible with all game engine and renders. 3 different polycount models included, based on your requirement you can use for mobile game, PC Game or high poly model included as well, so if needed you can use for 3D Animation or other general purposes. Textures are created for physical based shaders and you can use it for your game in Unity 3D, Unreal Engine and Crytek Engine. Works with most software’s and easy to use. Just drag and drop in your scene or in game and start using it!